What does the 5E Error Message Mean On My Samsung Washer? 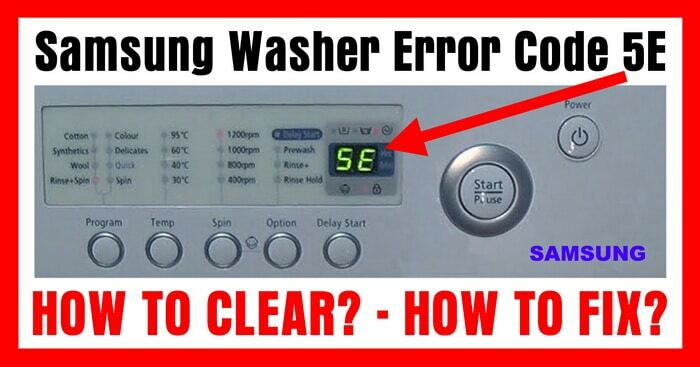 The Samsung washing machine will display the 5E error code if the water is not draining out in the allotted time. To alert you of this, the Samsung washer will make a buzzing sound if the water does not drain out of the washer within 15 minutes. At this time the timing indicator will display the “5E” error code. 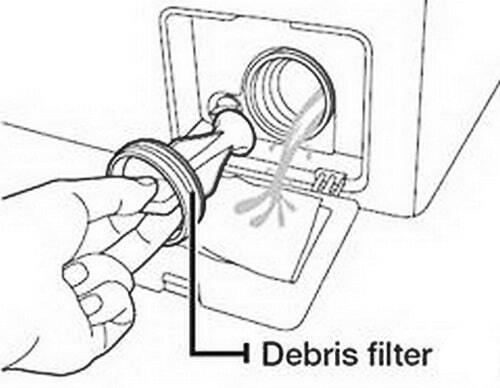 Step 1 – Clean out the drain filter at the bottom of your Samsung washer. 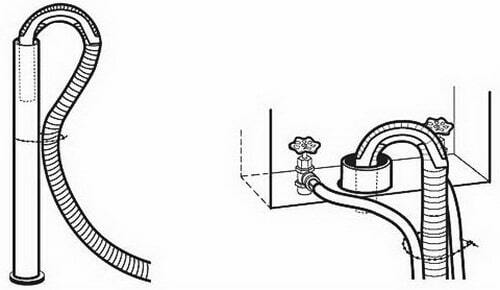 Step 2 – Be sure the drain hose located on the back of the washing machine is not bent, kinked, or clogged. 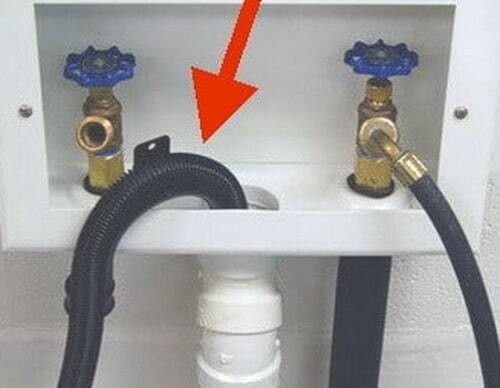 Step 3 – Be sure the washer drain hose is installed so the end of it is not too far down the standpipe. Step 4 – Check the drain pump that is located inside the washer to be sure it is not blocked and that it is receiving power. 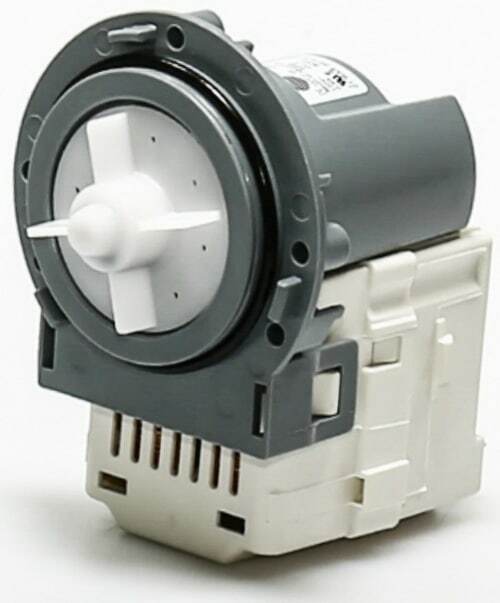 This video provides step-by-step instructions for replacing the drain pump on a Samsung washing machine. Common reasons for replacing the drain pump is if the washer is not draining and unclogging the pump and hoses does not fix the problem. This 5E error code applies to Samsung washing machines with the model numbers: WA85BWPEH/XTL, WA90BWQEH/XTL, WA95BWBEH/XTL, WA90BWMEH/XTL, and WA95BWPEH/XTL. If you need further assistance with your Samsung washer and the 5E error code, please leave a message below and we will be happy to assist you. First, a major “Thank You” to everyone involved in making this article and video available to me. I had the infamous 5E error message and my pump was making noise even after we had cleaned the debris filter. Thanks to your video, I was able to remove the front panel, detach the drain that leads to the pump, and find two objects that were clogging the drain even before the water got to the pump. That’s why the debris filter was clean. It took me one hour this time, 20 min max next time as it is very easy to do once you know where you’re headed. Anyhow, you just saved me at least 200$. Thanks a lot! I can’t get the debris filer out—keeps turning counterclockwise but won’t loosen and come out. Also can’t get cap off little house beside it. I think you need to push or pull as you twist. It is documented in the manual. Hi my Samsung wf42h5200ap/a2 drains properly untill it gets to the final spin cycle then gives a 5 E error code. only does it about every once and awhile. Checked for clogging and tested pump and everything is ok. Would you have any advice on what to look for. Front control board? My Samsung is not a front end load washer and my drain filter isn’t located in the front. Any more info on a top loading Samsung aquajet VRT? My Wa13V9 Samsung top loader empties the water but the spin cycle does not start. After a while i get a 5E error. It says PUMP may be CLOGGED or FAULTY on washer. It shows how to get to and REPLACE the pump but HOW TO CHECK IT FOR CLOGS? I don’t want to replace this thing if it is working. How do I tell if its getting power? If the machine instructions say to cut power to the washer before fixing it, how to determine if the pump is getting power? Test the washing machine drain pump separately with a meter. Check the pump for anything clogged INSIDE or near any of the lines connected to the drain pump. My Samsung washing machine is not completing a full cycle of washing. It stop on spin and the water is not draining out. Am getting 5E warning light. I am 99% sure it is the drain pump as I can get air to blow through the hose. The model of my washer is WF5750LSW. Can you please tell me the model part Number for this machine? That is the drain pump motor number. Samsung 5E Error Code = Water is not draining from the Washing Machine. If the water does not drain in 15 minutes then a buzzer will sound, and the remaining time indicator will show the 5E Error Code. -Make sure the drain hose is not clogged. -To make sure it is not clogged then detach the drain hose from washing machine and check for blockage. -Be sure the drain hose is not frozen. -Make sure the drain hose is installed properly. 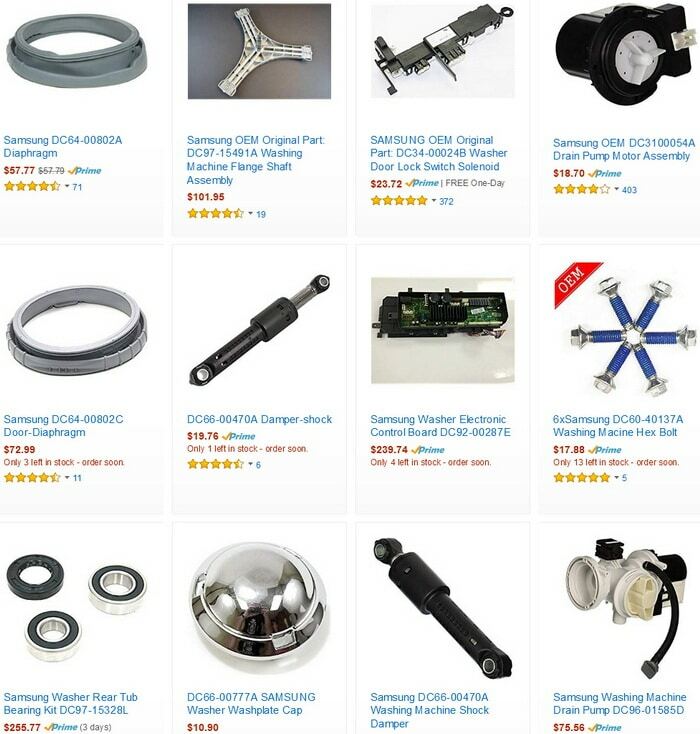 If you know for sure the drain pump is faulty… Check the image below and click to see which drain pump will work in your Samsung Washer. You guys are amazing!!!!! This is the first time I’ve ever done anything like this before and your instructors were so good even I was able to successfully repair the pump. You’v saved me a ton of cash right before Christmas and made me feel empowered as a woman.